Treasure Horse Slots is a deceptive golden beast. On the surface, it looks like a retro slot machine, complete with visible paytable and a 3x3 layout. But start chasing these gilded mares and you could unlock free spins, massive multipliers and a 5,000x max game win. Pragmatic Play's latest game features a tranquil Asian setting. A fine mist covers a background of pagodas, mountains and gentle waterfalls. But honestly? The action on the reels will have you feeling anything but relaxed. But why should you be excited about a game that looks as vintage as this one? 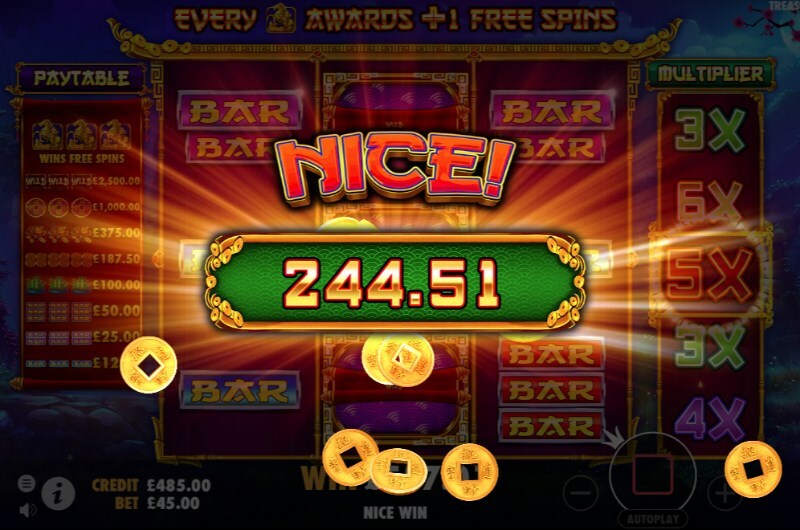 Find out in our Treasure Horse Slots first impressions. Despite the vintage looks, this slot is packed with modern features. The Treasure Horse Slots bonus is the crown jewel of the game - and can be activated by landing three treasure horse scatters. This will activate the free spins - and a brand new reel will be added to the game. This 4th reel features a whole range of lucrative multipliers. Land a win during the 8 free spins, and you will be awarded a guaranteed multiplier win. Considering these multipliers can climb up to 6x, this feature is one of your best chances for a big win. And thanks to the scatter symbols, you could hold out for that opportunity. 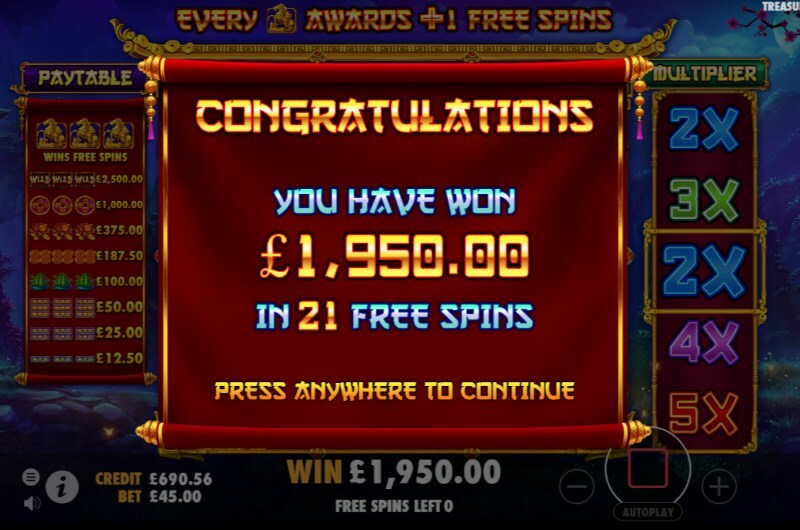 During free spins - any scatter symbol that appears on the reels will add another free spin to your balance. But that's not even the best part. There are no limits on how many extra free spins you could earn. Theoretically, you could stay in the feature for hundreds and hundreds of spins! Like the recently launched Triple Tigers slots, this game is beginner friendly. You can play Treasure Horse slots if you are relatively new to online slots - or if you are a slot machine master. Regardless of your playing level - there are plenty of quality of life improvements to take advantage of. First of all; if you are the type that relishes fast-paced game rounds - then there are several speed settings. You can activate quick spin - which raises the speed of each spin marginally. Or you can go for the turbo spin - which really amps up the pace. Most impressive of all is the autoplay features - which give you unparalleled control over your slot gaming. You will never overspend again thanks to these useful settings. You can stop on all sorts of triggers, like if your balance decreases by a certain amount or if you win by a set margin. Gorgeous design, a simple but fun feature set and huge win potential - this stallion gallops over the competition. Treasure Horse Slots is an instant Pragmatic Play slots classic that will appeal to almost anyone. But retro slot machine fans may have a special crush on this game. If you want to wrangle yourself some treasure horses, then you can catch them now in the Mayfair Casino lobby. Or if you want more information on the RTP, the free spins or the features - then you can read our Treasure Horse Slots review.